The Moon is in Aries today. Two shifts also occur today through early tomorrow: Venus enters Cancer (9:43 AM EDT) and Mercury goes direct (1:40 AM EDT). The Aries Moon also collides with Saturn in Libra and starts a void of course period, and asteroid Ceres forms a stressful aspect with Mercury. There’s a lot going on today; unfortunately some of it will jangle our nerves. People are vulnerable and needy or feel their needs are not being met; frustration sets in, and quarrels can ensue. Issues around nurturing, food and eating issues, home and family (and family patterns of behavior and relationship that stretch far back in time) can be emotionally charged, while at the same time we just want to disappear and retreat to the inner sanctum for a while. Venus in Cancer has the feel of the 6 of Cups in tarot; nostalgia, childhood memories, family karma, and an “out of the past” vibe. We may find pleasure in connecting with our past or history–it’s a great time for antique shopping or doing things to beautify your home and surroundings. It might be a good idea to bake some cookies, go through old photos, connect with old friends, and generally stay out of the line of fire today. And with Mercury just going direct and the Moon void of course until 3:28 AM tomorrow, it’s probably a good idea to wait before throwing yourself into new projects or major campaigns that require precise communication. Otherwise you might end up spending all day trying to get something done only to find that it’s all come to nothing or whatever you’ve done can’t be used. (Some astrologers feel Mercury is in its “Storm” period (note the storm imagery in both the Kozminsky and Sabian Symbols, below). Mercury is still moving very slowly each day; it will be out of this period by August 13th. We’re not quite out of the Mercury retro woods yet. Sabian Symbol for today’s Sun: “Sunshine just after a storm”. 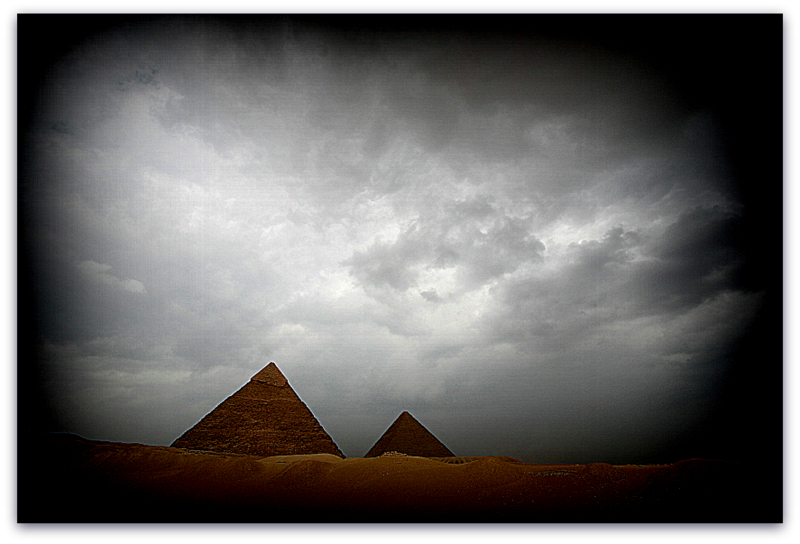 Kozminsky Symbol for today’s Sun: A pyramid in the midst of a sand waste, with lowering black clouds above it”. The Keyword for the Sabian Symbol is “Recovery”. The Kozminsky and Sabian keywords say it all. We’re definitely feeling a little “vexed out” (Moon in Aries opposite Saturn in Libra) and may require a little down time in order to deal with things. Yes, it’s one of those “What’s it all about, Alfie?” days. We may find ourselves wondering if it’s all worth it, if we’re on the right track, and if things we once thought were so important really matter after all. We need to take another look at what we’re doing and aim higher (Egypt and the pyramids are also symbols of spiritual insight and inspiration gained by past societies or in past incarnations). “The Enlightened Leader”. Here’s our ancient ruler from “Ozymandias”, fighting an internal battle and learning how to access his own power. This combo gives the feeling of being “on fire” as both the 5 of Wands and the Emperor are fire cards (Moon in Aries also brings in the fire energy). This combo also relates to wrestling with inner demons/feelings of doubt and restriction and testing the limits of social restrictions and responsibilities (Moon in Aries opposite Saturn in Libra). Changes occur that require a new use of our power–this is the enlightened leader who is fueled by inspiration from within, someone who has wrestled with their own demons and now understands how to lead wisely and well.